President Donald Trump signed and celebrated the farm bill Thursday, while the administration also moved to force more people who enroll in food stamps to comply with work requirements, despite the fact that Republicans were unsuccessful in pushing the same measure through Congress. Republicans have pushed for more work requirements for food stamp participants and for the U.S. Department of Agriculture to allow states to impose more requirements such as drug testing. But those requests were left out of the recently approved farm bill after Democrats refused to move forward with the changes and other GOP proposals. 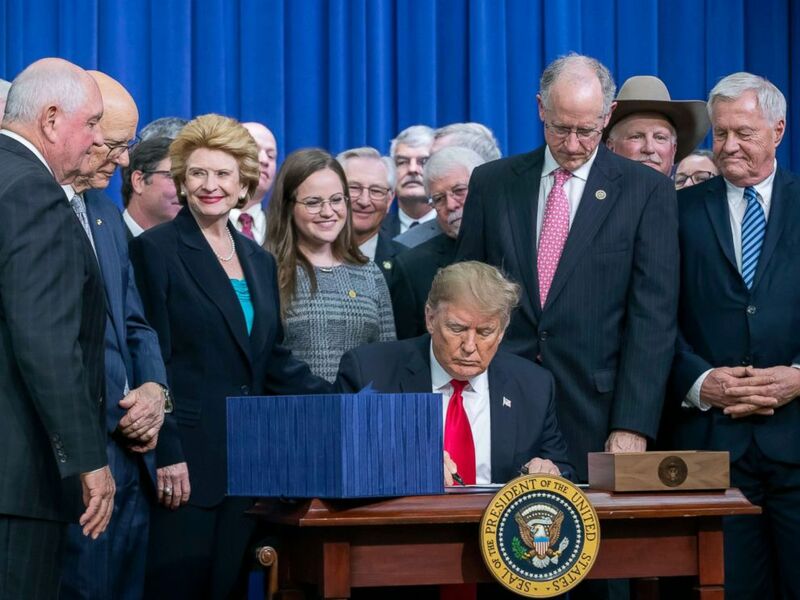 President Donald Trump signs the Agriculture Improvement Act of 2018 farm bill at the White House in Washington, Dec. 20, 2018. After months of negotiations the 2018 farm bill does not include changes to the Supplemental Nutrition Assistance Program that House Republicans wanted. But he did direct the USDA to pursue some of those changes through a rule, saying with this "thriving economy" people should have to go back to work. "Under this new rule able-bodied adults without dependents will have to work or look for work in order to receive their food stamps. Today's action will help Americans transition from welfare to gainful employment, strengthening families and uplifting communities. And that was a difficult thing to get done," Trump said during the event in Washington. Agriculture Secretary Sonny Perdue told reporters Wednesday that Trump might not have supported the massive farm bill without a separate food stamp reform rule. The bipartisan bill Trump signed Thursday provides billions of dollars in assistance for farmers, research projects and mental health programs in addition to re-authorizing nutrition assistance programs and legalizing industrial hemp. "These actions will save hardworking taxpayers $15 billion over 10 years and give President Trump comfort enough to support a farm bill he might otherwise have opposed," he told reporters Wednesday night, citing the USDA estimate of how much money the program will save from people no longer eligible for the program. 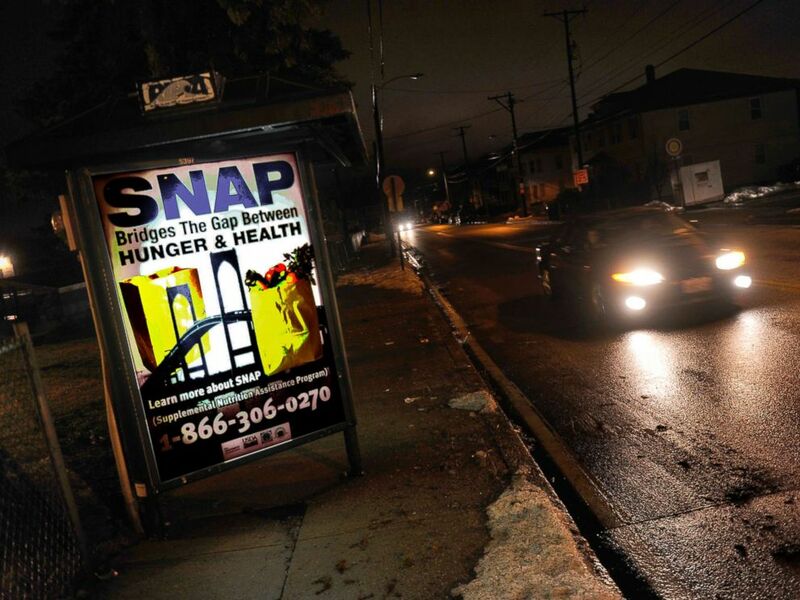 A sign at a bus stop telling residents about the availability of the SNAP program, March 1, 2013, Woonsocket, R.I. Under current SNAP rules, able-bodied adults with no dependents enrolled in food stamps are required to work, participate in work training or enroll in an education program for at least 80 hours a month to receive benefits. Those who don't meet that requirement are only eligible for three months of benefits in a three-year period. The Trump administration said the waivers are meant to be temporary relief during tough times, but that with lower unemployment nationwide, more people should be required to work to receive food stamps. "The bottom line is this," Perdue said. "In 2016 there were 3.8 million individual [able-bodies adults without dependents] on the SNAP rolls with 2.8 million or almost 75 percent of them not working. This is unacceptable to most Americans and belies common sense particularly when employment opportunities are plentiful as they currently are." Even though Democrats and some Republicans ultimately blocked similar changes to food stamps in the farm bill, the USDA can make some of the changes through the rule-making process. The current law says states qualify for waivers if unemployment is above 10 percent or with a "lack of sufficient jobs," usually relative to the national unemployment rate. USDA's proposed rule would redefine a "lack of sufficient jobs" as 7 percent unemployment and make administrative changes like limiting waivers to one year and eliminate state-wide waivers in favor of smaller areas. Food and Nutrition Service Administrator Brendon Lipps said the USDA estimated 75 percent of areas that currently have a waiver would no longer qualify under the new rule. He said the able-bodied adults on food stamps who are not working could now be subject to work requirements depending on where they live. 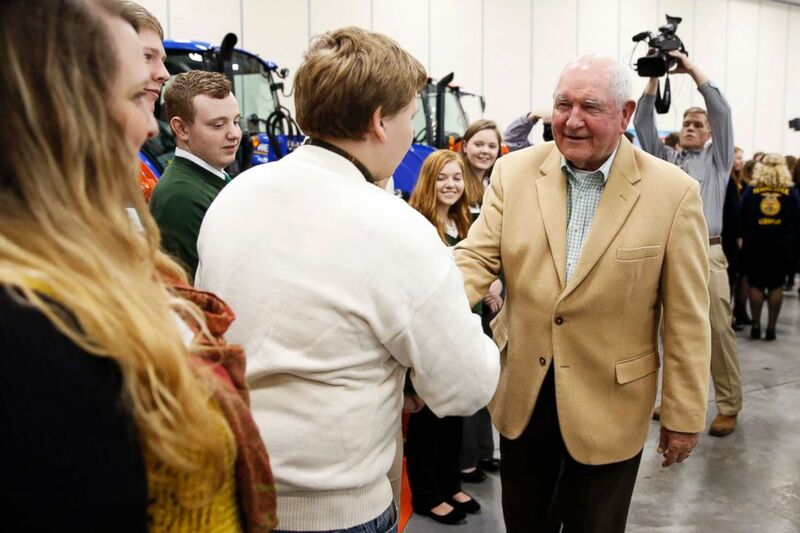 Agriculture Secretary Sonny Perdue, right, greets a youth group at the Wilson County Exposition Center Tuesday, Dec. 18, 2018, in Lebanon, Tenn.
Robert Campbell, policy director for the anti-hunger group Feeding America, told ABC News that the administration estimated more than 750,000 people could lose benefits because of the rule. He said the farm bill actually does more to support workers and provide training for workers, while the proposed rule only punishes people who can't find a job. "We're concerned that taking food away from people will not make them more employable and it will not help them in their prospects," Campbell said on ABC News' The Briefing Room. House Agriculture Committee Chairman Mike Conaway, R-Texas, praised the rule, comparing it to the controversial House version of the farm bill that he said would allow able-bodies adults "to seek new opportunities and achieve their goals." But Sen. Debbie Stabenow, ranking member of the Senate Agriculture Committee, said the rule blatantly ignored the bipartisan farm bill. "Congress writes laws and the Administration is required to write rules based on the law, not the other way around. Congress chose not to change the current SNAP work rules in the Farm Bill, and instead, focused on strengthening work programs that actually help people get jobs," she said in a statement, adding, "Administrative changes should not be driven by ideology. I do not support unilateral and unjustified changes that would take food away from families." Lipps emphasized the rule would not apply to the elderly, people with disabilities or pregnant women but is intended to encourage people capable of working to find jobs. Some groups like the left-leaning Center for Budget and Policy Priorities say the USDA numbers don't tell the full picture because people often sign up for food stamps when they're between jobs or people may have a job but still make less than the federal poverty level. The move is the latest effort to reform programs intended to push low-income or unemployed Americans to become more "self-sufficient" through work requirements or changes to welfare programs like nutrition assistance, public housing or Medicaid.